Isagenix 30 Day Starter Pak NZ | Free Signup + Save $194! 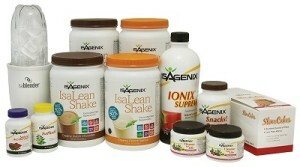 This pack has been discontinued by Isagenix and will no longer be offered for sale. It has been replaced by the Weight Loss Premium Pack. Discover a new way to boost your health, fitness and appearance. With the Isagenix 30 Day Starter Pak, you can make the first step toward a sustainable, healthy lifestyle. When you purchase the Isagenix 30 Day Starter Pak, you receive all of the tools that you need to improve your health and nourish your body. This kit boasts of the best-selling 30 Day Nutritional Cleansing Program from Isagenix as well as a FREE one-year membership (a savings of $25). It also includes like the Isagenix IsaBlender and SlimCakes. With the Isagenix 30 Day Starter Pak, you have all of the tools that you need to change your lifestyle and enjoy lasting improvements to your physical health. The Isagenix Starter Pak is an improvement over the standard 30 Day Cleanse because it comes with the powerful IsaBlender. Using the IsaBlender, you can whip up the creamiest, tastiest shakes. You enjoy better blended smoothies while your body gets to absorb the vital nutrients, minerals and vitamins that it needs to thrive. If your supply of Isagenix shakes and cleanses starts to run low, you are protected with your one-year membership. Through this free membership, you can stock up on all of your favourite Isagenix items at the best prices available. Get started on a total lifestyle makeover. You have the ability to be the best, healthiest person that you can be with an Isagenix 30 Day Starter Pak. Through Isagenix, you can jump start your metabolism, boost your energy levels and get started on losing those extra kilograms immediately. Please note: this is 100% optional. If you wish to simply purchase and use the products, you can do so. With the Isagenix income earning opportunities, you can earn money by selling the product you love. Within two months of selling Isagenix products, I was able to quit my 9-5 job and enjoy a greater level of financial freedom. I could work where and when I wanted to and live a healthier lifestyle. To get started on your financial future, you need to use the ‘Sign up and Save’ (autoship) option during checkout and order $210 or more from the site. Once this happens, I will send you information about the Isagenix program and help you start on your own path to success. This entire process is completely optional, but is a great way to earn extra money from a product that you already enjoy using.